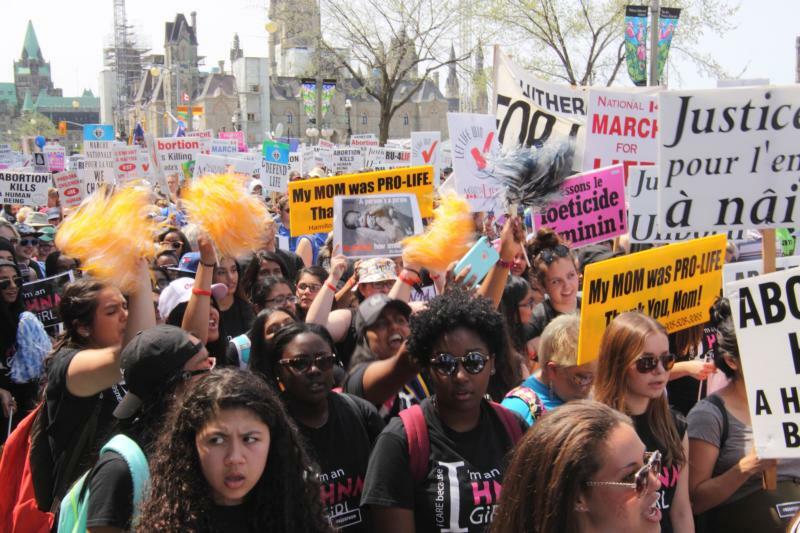 OTTAWA, Ontario (CNS) — As the Canadian Parliament considered a bill legalizing euthanasia and physician-assisted suicide, thousands gathered May 12 for the annual National March for Life. The march’s focal point always has been “the threat to life at its earliest stages through abortion,” Cardinal Thomas Collins of Toronto said in his homily at the annual pro-life Mass at Notre-Dame Cathedral Basilica. “These days, we have witnessed a growing threat to life at the other end of the earthly journey, through the misguided decision of the Supreme Court and the preparation of legislation to implement that decision throughout our land,” the cardinal told the congregation. “The scourge of euthanasia and assisted suicide is upon us, and we need only to look to countries of Western Europe that have gone before us down this dark path to see what is in store,” he added. Cardinal Thomas carried his message to Parliament Hill where he encouraged marchers to act, to join the Coalition for HealthCARE and Conscience and to promote both palliative care and pregnancy care centers. Archbishop Christian Lepine of Montreal told the crowd life is a “gift from God,” no matter how fragile or weak it is. Archbishop Luigi Bonazzi, papal nuncio to Canada, brought a blessing and a greeting from Pope Francis to the crowd. In the end, the committee rejected the proposed amendments to strengthen safeguards for vulnerable mentally ill and disabled Canadians. Falk was one of a dozen pro-life members of Parliament who spoke to the marchers. Ekeocha decried Canada’s decision to send money to fund abortion in developing countries around the world. “I beg you to not use the blood of the innocent to pave the path to development,” she said. Security was extremely tight on Parliament Hill to prevent opposition protestors from storming the steps while the program continued as they have done the previous two years. When a counter demonstration of about 100 people tried to confront the marchers at one point, police changed the route, shortening it by two blocks to prevent any confrontations, said Jim Hughes, president of the Campaign Life Coalition. On the eve of the march, however, protestors interrupted the annual vigil at Ottawa’s Human Rights Monument, Hughes said. About 30 protestors stood in front of the pro-life speakers, blew whistles and shouted obscenities. “There was a lot of cursing and profanity in front of the children and the nuns,” he said.